Partly cloudy skies. Low 41F. SSW winds shifting to NNW at 10 to 20 mph.. Partly cloudy skies. Low 41F. SSW winds shifting to NNW at 10 to 20 mph. 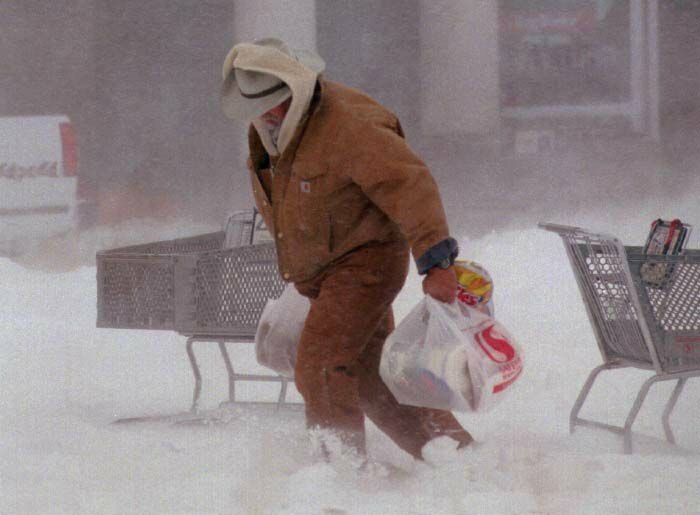 A look back at the epic blizzard of 1997. It started on Friday, October 24 and ravaged the region the entire weekend. Kaitlyn Irwin, 3, plays in a deep trench her parents dug so the mailman could get to their mailbox in the 5300 block of Balsam Street on Monday Oct. 27, 1997. The mailboxes were completely buried in a 10-foot-tall snowdrift. Ken Powell makes his way through the Safeway parking lot at Circle and Galley in Colorado Springs, Colorado Saturday October 25,1997. He joined many others trying to get food and supplies during the blizzard that hit Colorado Friday night and continued Saturday. Powell said "My wife and kids got a craving for some green chile", so he headed for the store to get the ingredients. October 1997 - Passersby give motorist Joe Proctor a shove along West Bijou Street in Colorado Springs on Saturday morning, October 25, 1997. Proctor said he had to get to the store but wasn't able to get past the end of his block. Fort Carson MP's work to loosen a Humvee from a snowbank Saturday afternoon October 25, 1997 on Fontaine Boulevard east of Widefield, Colorado. The vehicle was part of a convoy of four Humvees of MP's heading east toward eastern El Paso County to rescue stranded motorists when it got stuck. 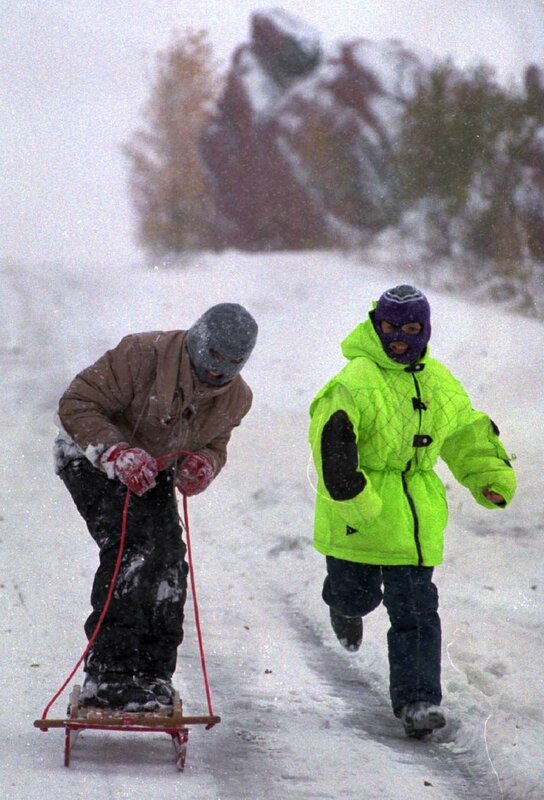 Darius Adams,15, tries out a new sled on a steep incline in Manitou Springs as his brother David, 9, tags along. The brothers recently moved from West Palm Beach, Florida and this was this first time in the snow. 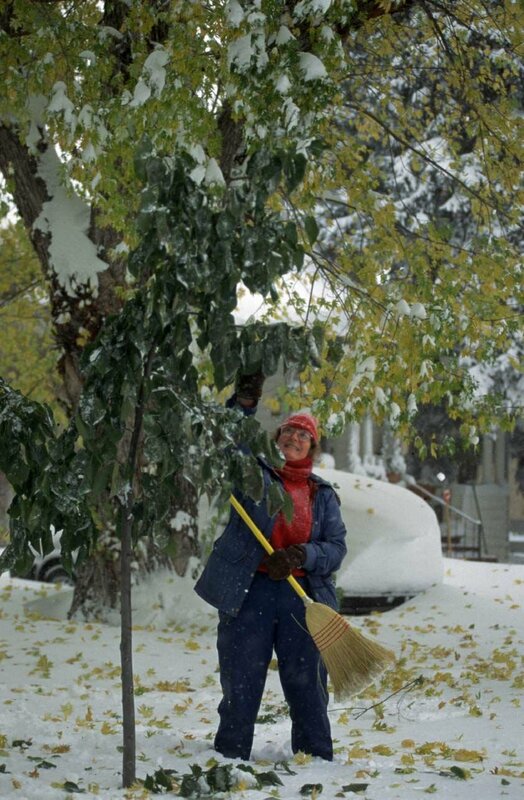 Pat Clark knocks the snow off of a fledgling tree in her front yard on Weber still full of green leaves. She was working in the snow on Saturday afternoon. Erin Stewart reaches with a shovel to knock the thick snow buildup off of the roof of her house on Tesla Street on Sunday, October 26, 1997. Erin and her mother Becky spent their first weekend in this house. 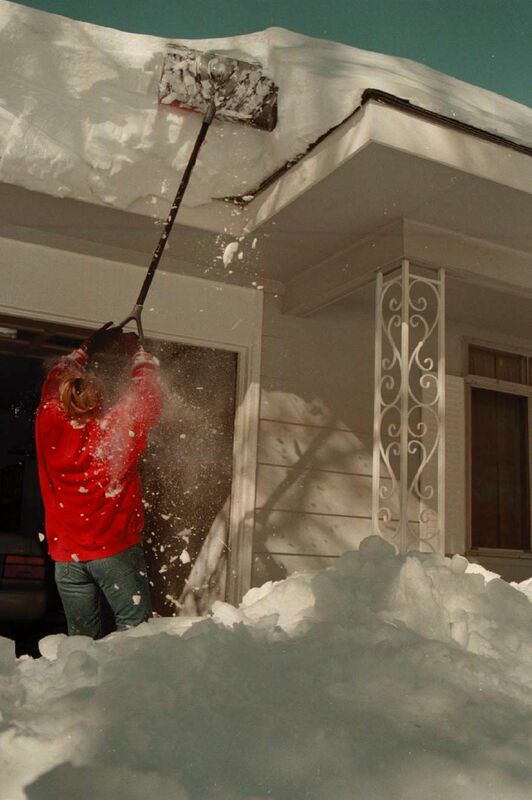 October 1997 - Shannon Mattie digs out her car from a nine-foot-tall snow drift in the 4900 block of Slickrock Drive on Sunday morning Oct. 26, 1997. Ben Schuler, 8, makes his way across the 5100 block of Luster Drive on Sunday morning Oct. 26, 1997. The neighborhood Sundown at Nor'wood on the city's northeast side was hit hard by Saturday's blizzard. There were snowdrifts as high as nine feet tall. A truck lies buried in the snow off Fontaine Road with roses stuck into its bed in memory of the lives lost to the passengers over the weekend. October 27, 1997. Twelve-year-old Garrett Brass checks out a Department of Transportation snowplow that remained snowbound on Highway 24 east of Colorado Springs Monday after rolling during Saturday's blizzard. Highway 24 opened from Colorado Springs to Limon Monday. Dan Royse, left, and Grant Hudson dig out Sandy Trujillo's Jeep Cherokee along Highway 24 near Falcon Monday afternoon. Trujillo slipped off the highway Friday night at 10pm was able to get a ride to the Falcon Fire Station where she had to stayed until Sunday at 5pm. By the time she got back to her car Monday only the roof was visible. 10/27/97 - DOWNTOWN SNOW - A T-shirt and shorts clad shopper walks along a narrow path through the snow on Tejon, Monday morning. It felt like summer though to most residents after the frigid temperatures during the weekend. Tony Kisling helps dig out a friend's driveway by hand Monday morning on Judge Orr Road just east of Highway 24.